Just because I know that sometimes a relationship with a serger can be frustrating (as any other relationship, in fact), I’d like to share with you some of my little tips and tricks about serger’s tensions troubleshooting, learnt along my sewing journey; you’ll get the most if you’ll take a look at my 10 best beginner’s tips too, one of my most visited and pinned posts! What is tension, on a serger? 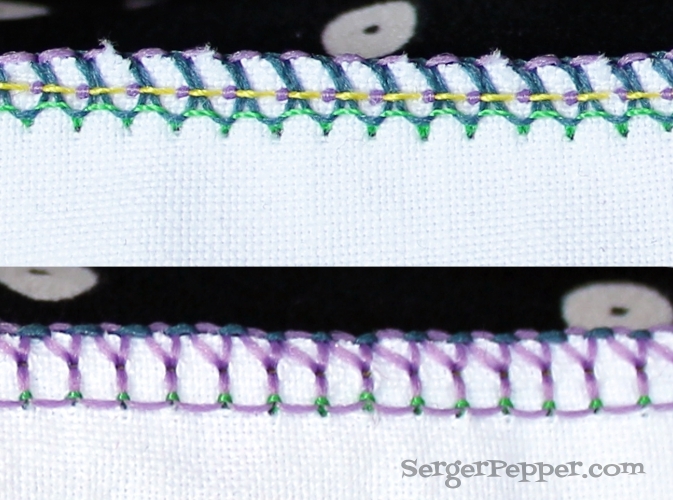 Tension on a serger (like on a sewing machine) is what decides the amount of thread that goes into the seam, it’s related to thread’s speed: if you increase tension, less thread will flow into the seam, and vice versa. It depends on many factors, like the type of thread, type of seam, fabric thickness, just to name some of them. When you buy a serger, usually, you’ve got it perfectly threaded! A lot of people start sewing without taking more than a quick look to all those threads and their routes… then something goes wrong and… panic! Just a side note: maybe your serger isn’t exactly like mine (I have a Necchi 181, for the record) but they’re all similar. If you’re stuck, please ask for help! Say “Thanks, Mamma” and Pin this, quickly! Find the balance: the Perfect Seam! But what if tensions are messed up? As a rule of thumb, on most sergers, you should start with all four knobs on 4, usually it’s a great starting point for a 4-thread stitching. If it’s not perfect, and you’re a visual person like me, you should take a look at some variations and understand what causes them: this will help you to learn which knob you’ll need to touch later! To analyze tensions troubleshooting in-depth, I’ve sewn some samples putting tensions knobs on 0 (zero) and 9 (nine), just to see what happens in both front and back of the seam. You won’t find yourself in those extreme situations, but this will help you to understand how tension works. Maybe it’s obvious, but you need to tighten tension (higher number) if you see loops and to loosen it (go to a lower number) when you can barely see the thread , that pulls and distorts everything. 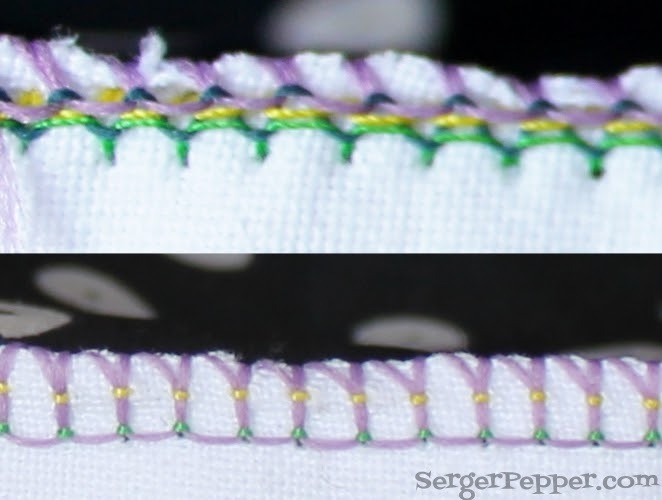 The lower row of stitches (green left needle) is no more a straight line, pulled up from the looper’s (blue in front, violet in back) threads. To fix it, just turn your left needle (green) knob to a higher number. 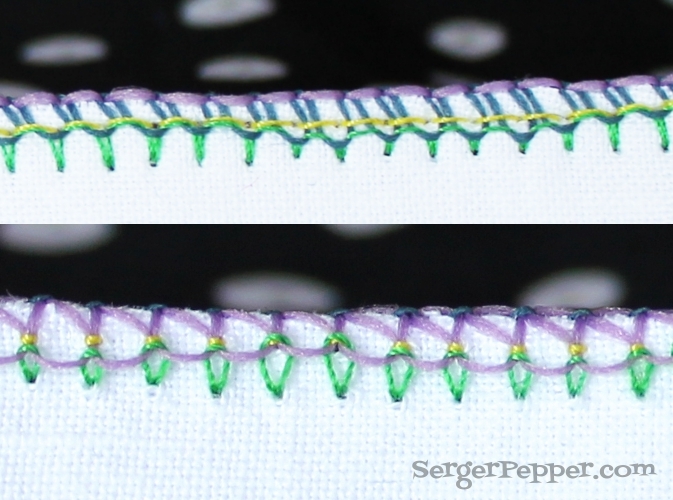 And here you can see the green thread too tight: on the front, it’s pulling out the violet looper, on the back side you can barely see some green spot! Turn down your left needle knob and everything will go better! Look at those yellow loops on both sides… it’s obviously needing a tightening action on left needle knob, to get back to a straight yellow seam line ! Now you see how this yellow thread is pulling out our violet thread (lower looper) on front while on the back is disappearing? Action needed: loosen right needle knob! Loopers should meet each other on fabric’s edge, midway. Here the lower looper is so loose that is looping on the back side… better turn its knob to a higher number! while Lower Looper (violet) is on the back (or low) side of the seam . 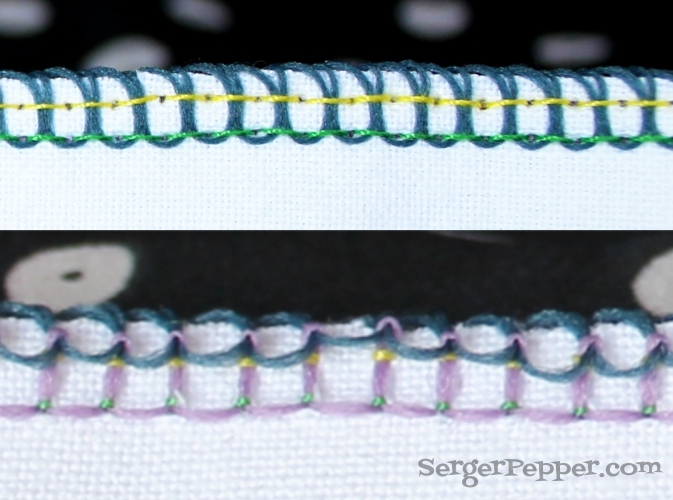 And here the same lower looper (violet thread) is too tight: you can’t see it in front of the seam and it pulls the upper looper (blue) and the left needle (green) on back of the seam, failing to meet the other looper’s thread on the edge of the fabric! Obviously, in real life, you’ll experience a combination of two or three thread’s tensions messed up. But, what if your tensions are messed up but you think tension disks are correctly set? Do I have a thread caught under a cone or spool? Is the thread following a wrong way, skipping a thread guide? Are there any threads that wrap twice around a thread guide? Did I check my needle condition? Is it inserted in the right way, have I chosen the right one (right type and size, basing on fabric)? Did I check for tangled thread on the stitch fingers or feed dogs, or loopers? Is my thread guide pole in its higher position (the first thread guide right after the spools)? Did I check for lint or bird’s nests of thread between tension disks? Your serger loves a good air blow from a compressor or a simple canned air! Is thread perfectly seating on tension disks? Floss them, eventually, just to be sure! 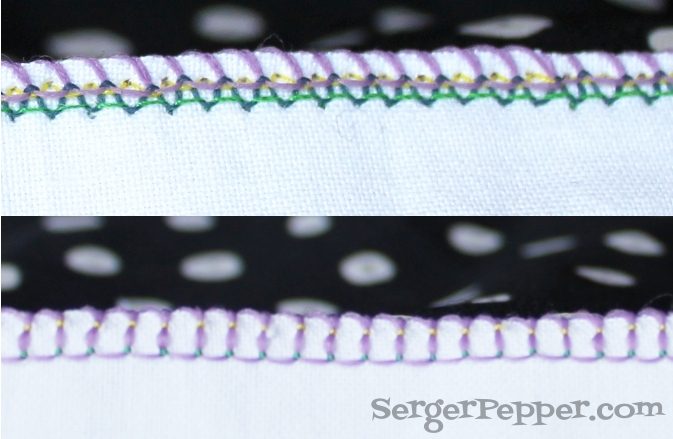 I hope you enjoyed my little rant about serger’s tensions. Let me know if something was unclear! I’ll be more than pleased to answer to your comments if you’ll be so nice to leave me a couple of words about how is your serger’s relationship… Or anything else! 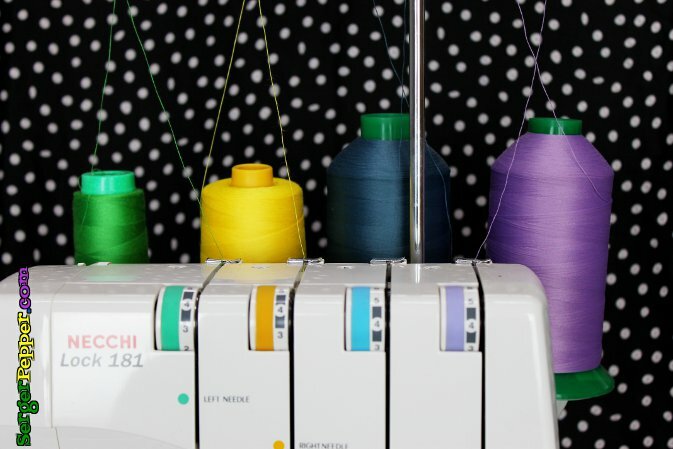 Is your new serger at home? Or is still traveling to you? Love your instructions, maybe I will get brave and pull out my serger that I have had but never used because I am scared! Thanks for such a detailed post. Your pictures and explanations are just what I need and I will be saving it for future reference. I just got a new serger last week so am having fun learning about it. I did diapers for my daughter, but using my sewing machine! Consider that 4 layers of fleece and 1 of cotton sounds like A LOT to me, I’m not sure if my serger could handle them! 2) play with your presser foot pressure (you should have a screw or knob somewhere, in the back of your serger) but remember to re-set it later, when you’re done! 3) use a hammer! Yes, a real hammer… Just hammer thick areas you’re going to serge, to flatten them down! 6) If all else fails, try sewing, then serging above this seam! Let me know if this helps you solve your problem! A mature lady in a fabric store today me to beat the snot out of Jean’s before using the machine on them. I recently had to replace my old serger and now I am a bit confused with this new one and I can not find this problem in my trouble shooting.. I am sewing for charity the pillowcase dresses using fat quarters and sewing 16 strips together would be so much easier if the serger made a “tighter seam”. 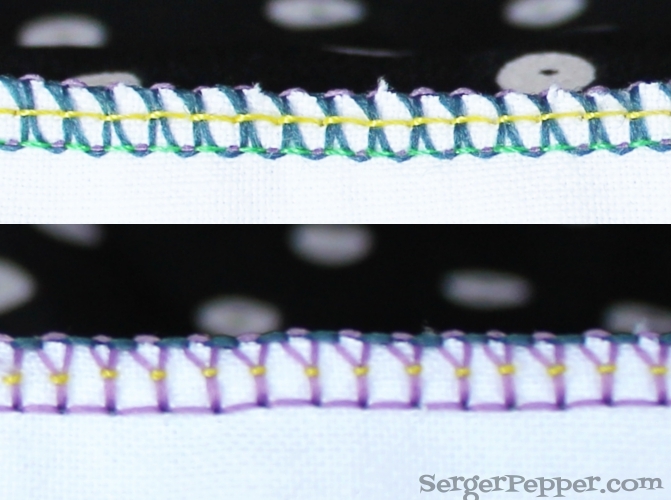 The first thing I would try is… re-thread your serger, using different threads (please do not knot-thread it, but do it the old-fashioned way, like shown here: http://bit.ly/ReThreadSerger). Change your needles with fresh ones too, double chcecking they are going all the way up before you close the screws. Thank you for the info. However,I am still having problems. After stitching, I can still pull on the seams and they separate about 1/4″ and the horizontal stitches show through on the right side of the fabric. Any ideas? I am serging some lightweight knit fabric and am getting some curling under on the back side. I am not intending to do a rolled hem, and it only the back that rolls. I can brush it out with my fingernail to lie flat but it takes time. The seam looks OK but it is messy looking if I don’t brush it out flat. I have tried adjusting my loopers but haven’t had any success. Any advice? Help! My left needle tension just doesn’t want to work right! It’s too loose (with loops showing on reverse) but when I tighten the tension incrementally the thread breaks before the problem corrects (about 4). The thread is moving fine off the cone and I have rechecked the threading a million times (and corrected a number of problems). It’s been a day since it came out of the box and I am getting desperate with strips of serged spandex all over my room! I used three different kinds/quality of thread on this dial. Is it broken or am I??? Do you change tensions with the pressed foot up or down? I usually lift it up, Lynn! Thank you so much for your great detailed picture and solution. I have a Pfaff five thread serger and I’m having trouble with it skipping stiches with the chain. I have tried new needles have rethreaded many times.. I have also played with the tensions. A little bit of background. I took it in for servicing and they replaced the lower knife, everything was good. I changed my thread and since then it has not worked properly. I have changed back to the original thread, but it is still skipping stitches and looping on the bottom thread. Could the problem be the upper knife needs to be changed. Hope you can guide me through this. Looking forward to you reply. I have been using my 4 thread overlocker (serger) for some time now but recently I’ve noticed that when I turn the fabric back to the right side and put any stress on the seam (particularly side seams) I can see horizontal treads come through, which doesn’t look very professional!. I have fiddled with every tension dial for each of the threads but I keeps happening! Do you know why this could be? Hey there hoping for some help! My left needle is not sewing on Double brushed Poly. It sews just fine on other materials (most of the time!) sometimes it’s skipping. It doesn’t matter what I do to my tension it won’t catch, and I’ve changed my needles! Any ideas?! Are you using a stretch needle? Or just a Universal one? This might be the problem. Another thing you can try is stabilizing fabric with some tear-off or soluble stabilizer (like the embroidery stuff) or, if you have any on hand, try with some toilet paper below the fabric. Just wanted to thank you for your suggestions. I tried everything or so I thought. Was ready to take my machine in to be worked on because I thought the tension was messed up. My husband was just going to buy me a new serger instead of paying to fix mine which is several years old, but well loved and used. Then the note about the needle being inserted correctly caught my eye. Sure enough, I turned the needles around and tada!! Just like new. Definately something to check first if you break a needle as I did. Thank you. Glad to know I helped you! This is the BEST serger tension post I’ve found! Your pictures are amazing, clear and detailed! Thank You so much, I’ll be studying this post alongside my new serger to fix my tension! I even had bought four different color threads to try and help me figure out which knob to change but I’m still being challenged. I love to sew but this new serger is making me feel much like a inexperienced seamstress. The challenge is on! My best tip is keep on trying, serge over scraps, play with tensions and widths and have fun. Happy new year, with your new serger! Help I can’t get my serger to work. 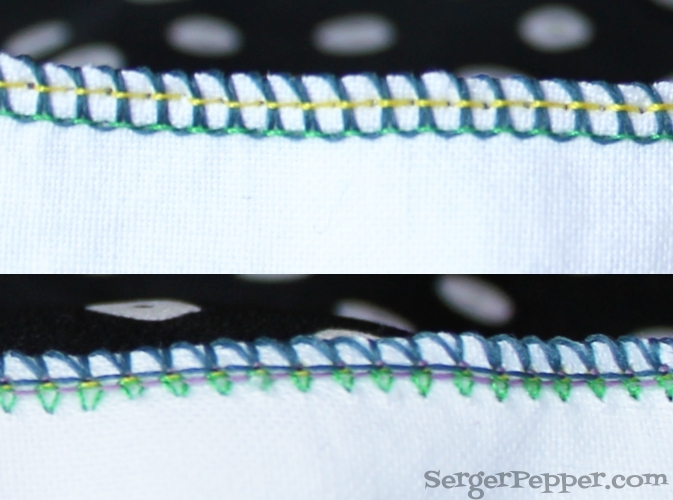 It will not serge only sews a straight stitch! Just want to say thank you. I’m so glad this post still exists and came up on top in Google because it solved my problem. Needed to tighten the needle. I checked several other websites too and this is by far the most clear, precise and straight-forward guide. Thank you. Hi, I hope you are still answering questions! I am using a used Babylock serger. The tension is erratic. I make adjustments and it seems ok, then it is all out of whack. The loopers are totally off the fabric, both top and bottom. I have adjusted everything again and nothing seems to work. One time it seemed to be from the needle tension, but adjusting that doesn’t seem to help. Do you have any suggestions for me? Oh-I am sewing on a light to medium knit. Hi, I am an experienced seamstress and have been serging for as long as I can remember. I have a new serger and I have learned how to set tensions for the types of fabrics I sew using. 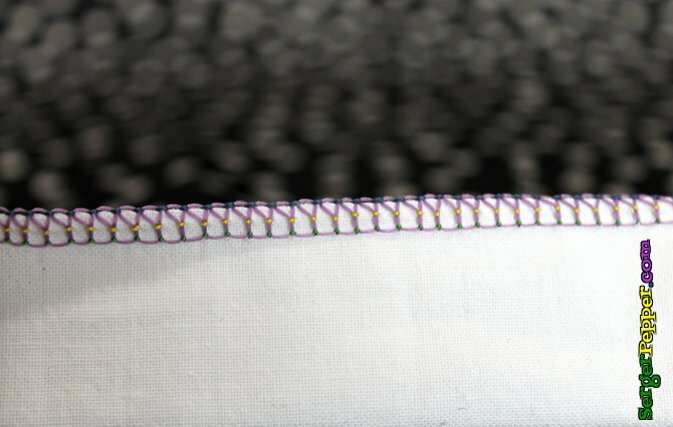 4-thread overlock stitch. When I am doing something like a sleeve with pleats at the shoulder, the tension that is set for two layers of fabric works fine – until I get to the pleats – then the left needle thread breaks or doesn’t stitch and the thread just stays straight on top, and loops start showing up on the edge, the right needle doesn’t sew either… I end up with a mess during the pleat section and then everything reverts to normal once I’m past the pleats. I have had numerous sergers and none has ever not been able to change thicknesses slightly… it’s a quality Elna serger that is highly rated… how should I set the tensions so that it can sew through 2 layers then 4 layers then back to 2 layers… is it better to go tighter in general or looser in general… or do people adjust their tensions when they come to pleats?? I’ve never heard of such a thing and for me right now the workaround is to serge the armhole separately, and serge the sleeve edge, then just sew the two together… but that is triple the work and not a time saver for sure. Thank you! First of all, let me say you create such wonderful outfits! I don’t think there’s a rule for serging over pleats or for using higher of lower tensions in this cases, and it never happened to me neither to have to change tensions me neither. What kind of fabric are you sewing? Is that a thick or a sheer? Looks more like a needle problem than a tension one. I’d love to hear back from you, to help you find a way to make it work. Looks like a Four-Thread Overlock with Chain Stitch (instead of safety stitch). It is used for sewing woven fabrics (has low to nothing stretch) and should be avoided in knits (unless you don’t need the seam to stretch). It is also used for sewing muslins because the chain stitches are easy to remove. Is that a home serger or an industrial one? I just bought my first serger after sewing for many years (Brother 1034d). It forms a chain when there is no fabric but after sewing perfectly for about 6″ stopped forming loops. I have rethreaded it a dozen times using the book’s diagram and have changed the 4 tensions from the original #4 up to 5 and down to 3. Also oiled it as the book recommends. Nothing has helped and I am ready to return it. Any suggestions to get this working properly? Is is still forming a chain without fabric? If you are sure you have correctly re-threaded it and that there are no threads inside the tension disks, chances are your machine has problems. Thank you! Great advice and since I’m a visual learner as well the pictures were such a bonus! And great teaching method on the different colored threads. Again, thanks! My hubby bought me a serger for Christmas and I have been trying to understand stitch balancing. Your article is very helpful. The pictures are great. Thanks!! On the upper looper, I thread with wooly nylon, while I use a regular thread on the lower looper and the left needle. No right needle. I start increasing the lower looper tension (start with 2x) and decrease the upper looper tension (start with 1/2). Shorten the stitch to something between 1 and 2. Then I start testing on the fabric and fiddling around to find the perfect spot, making sure the nylon thread is perfectly covering the hanging edge of the fabric. It’s a bit of a trial and error process, but it will eventually become easier once you get the hang of it. This is sooo helpful!! I’m just still having issues no matter who tight I make the needle one and two they are loose! I’m new to my serger I did make one sweatshirt and it was great no tension issues now I’m sewing with the same fabric and I can’t get the tension right! Any suggestions?? I used this post to help me with my Juki 3716 5-needle. Super helpful to me. Thanks! Thanks for your detailed guide! I still couldn’t get my tension right on the left needle, then I remembered. .. when in doubt, rethread! Re-threaded from the cone and it’s prrfect!! You’re my only hope, Obi-wan. Any ideas before I decide my machine is incapable of a proper 4 thread overlock? Katie, look at her questions at the bottom of the article. If the machine has not been professionally serviced, consider that too. Could be fluffies in the workings. I have an old Bernette 234 which I bought used. The machines are wonderful but temperamental as a film star to dig out an old phrase. But frankly, once I learned how exactly you must thread it and check the thread pathway, we became friends. What saved the day for me was your questions about ease of thread flow (so to speak). I had checked threading but had some gross looping on the back of the work, an indicator of too tight tension. But this is an excellent article. Thank you so much! your post was very helpful. I still couldn’t manage to get the tension of the lower looper right 🙁 I followed all your indications, first by increasing the tension of the lower looper thread, then decreasing the tension of the upper looper thread and also both together and it didn’t make much of a difference. I’m using a Singer Professional 5, which I knew when I bought it that she needs a bit of patience ;-). Do you have any idea what I could try next? thank u! this was alot of help! Hello! What if you are sewing with a kit fabric and after your all done sewing your shirt doesn’t stretch at all. Is that a tension problem? Everything I buy from the store that is knit stretches no problem. I’m not sure if maybe the tension is too tight and if it is then is it my loopers or the left and right needle…. thank you for your help!